Immigrants are set to lose their temporary legal status — and their jobs. 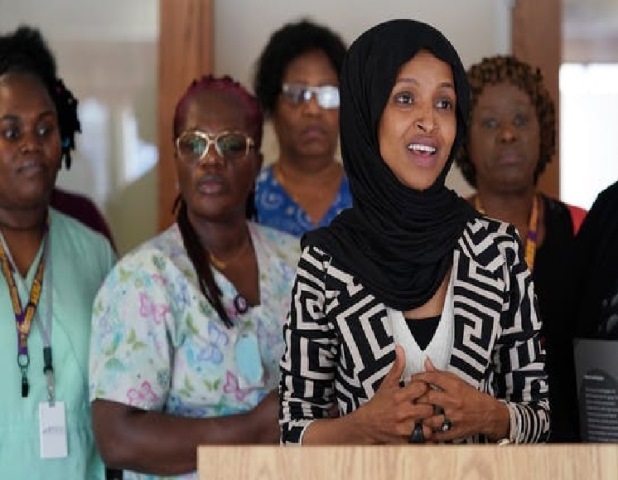 Rep. Ilhan Omar spoke during a press conference on the impacts of the DED cancellation Thursday in New Hope. At St. Therese senior care facilities across the Twin Cities, Liberians serve hundreds of residents food, administer medical care and clean. Yet 150 of them — roughly one-fifth of the organization’s workforce — are set to lose their jobs by April, after President Donald Trump ends their temporary legal status. The looming elimination of the Deferred Enforced Departure (DED) program involves more than tearful stories of family separations as many Liberians return to West Africa after decades in the United States. It also will have a dramatic effect on Minnesota’s health care industry. “To lose that skilled care is an enormous negative impact,” said Kym Fisher, chief human resources officer at St. Therese, a Catholic nonprofit organization with facilities in five suburbs. She noted that Minnesota has 4,000 job openings in the health care field, and with low unemployment and a workforce shortage “comes the hardship of getting qualified staff.” In recent years, Liberian immigrants have filled many jobs as nurses, home health aides and medical assistants. Fisher and several executives from St. Therese recently traveled to Washington, D.C., to advocate for extended protections for Liberians affected by DED, though political action is unlikely to happen by the March 31 deadline. Thousands of Liberians came to the United States to escape civil war in the early 1990s, and presidential administrations of both parties have extended protections for them since 1991. But Trump said last year that conditions in Liberia had improved and gave people in the program one year to return to their homeland. Without DED, St. Therese “will not have all those people who work here and like the residents, cater to the residents, know their needs,” said Deah, holding her hands out in a quizzical gesture. Abena Abraham, an organizer with the SEIU Healthcare Minnesota union, said the union is working to have employers hold the positions of affected Liberian employees open for one year and allow them to return at the same level of pay and seniority if they adjust their legal immigration status. “They would like to make accommodations to have folks come back, because with the shortages that already exist in many health care jobs, [employers are] just not willing to have folks go without care,” said Abraham. St. Therese is allowing workers to come back if they find a new way to get work authorization. Those include people like Elizabeth Sirleaf, another dining aide who enjoys being in the kitchen. “It’s something I put all my mind to,” she said of her job. And Christina Wilson, a nursing assistant who has always enjoyed taking care of elderly people, now wakes up in the night, fearful of what will happen next. Both women work on the New Hope campus.